The Grammy Awards tend to be an annual amalgam of moments ranging from genuinely cool victories (Cardi B, anyone?) to reminders of just how off base the Recording Academy and show producers can be. If we’re lucky, we’re gifted with one unifying nugget of joy that is just objectively good, and this year, that moment was encapsulated by the sight of the Korean pop megastars BTS jamming out to Dolly Parton. So yes, there is still good left to experience in this world. BTS made its Grammys debut last night, which included a presenting gig for Best R&B Album. And when its members weren’t handing off trophies, they were busy being the kind of fun supporters that have been missing from award shows for a few years. During her own tribute, Dolly Parton joined Miley Cyrus for a duet rendition of “Jolene;” mid-performance, the camera panned to the men as they joyfully sang along, which is exactly what you’re supposed to do whenever “Jolene” plays anywhere in your vicinity. They could also be seen thoroughly enjoying H.E.R.’s performance, of whom they’ve been vocal fans in the past. H.E.R. was quick to let everyone know that the feeling was mutual on Twitter, just ahead of the show. 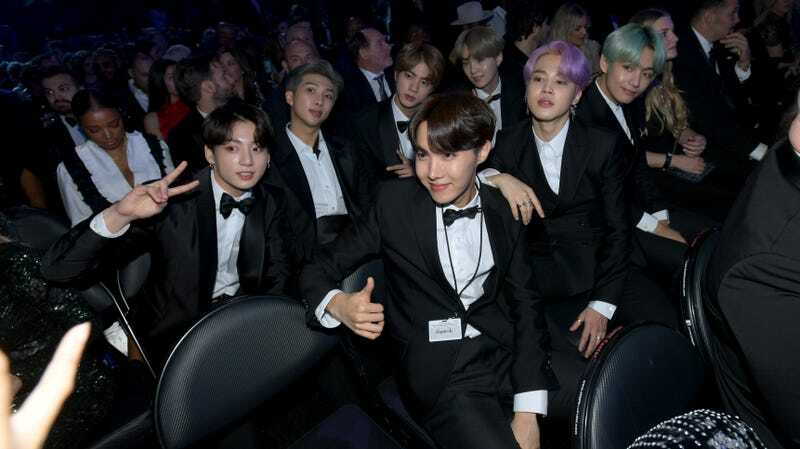 The group has managed to craft a barrier-breaking career, and last night was no different: they became the first K-pop group to ever present at the Grammys. Maybe next year will bring us a gilded shot of Dolly shoulder-bopping to a BTS song, if we’re even remotely fortunate enough.